Manta rays feed with a unique filtration system that allows water to pass through while tiny particles of food – even those smaller than the organism's filter pore size – "ricochet" away and are eaten. This filtration mechanism, since it repels rather than traps particles, resists clogging, making it promising for industrial applications like treating wastewater and reducing microplastic pollution. Many different mechanisms for solid-liquid separation are used in industrial and biological systems, including a sieve (commonly seen in a colander to drain pasta), cross-flow, and hydrosol and cyclonic separation. However, these filter systems often clog, making them costly and time-consuming to clean. Manta rays possess filtration systems distinct from other animals; they feed by opening their mouths as they swim, catching tiny plankton while simultaneously expelling sea water through their gills. The anatomy of manta rays is well-understood, yet the separation mechanism used by their filtering apparatus remains elusive. Raj V. Divi and colleagues examined the fluid flow around the manta rays' filter-feeding mouth by using physical modeling and computational fluid dynamics (CFD). They created a 3-D printed model based on the Giant oceanic manta ray (Manta birostris) and placed it in a recirculating flow tank filled with dye, used to visualize flow around the tank. Flow separation happened behind the leading edge of each filter lobe, the authors found, causing a large vortex within each pore. In the presence of particles, neutrally buoyant particles representative of plankton were repelled away from the filters. A CFD model revealed that contact forces cause the particles to "ricochet" away from the filter pore and backward to the faster-moving freestream flow. 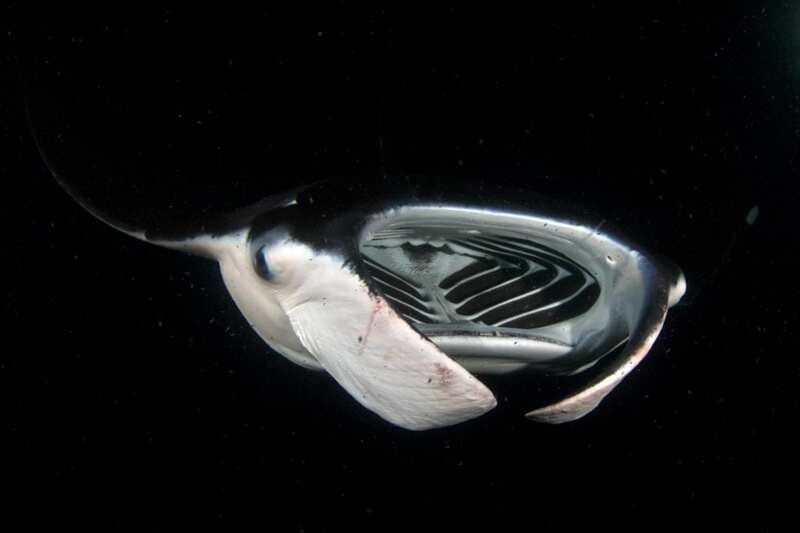 This shows that the little particles of food sucked into the manta rays' mouth are in fact eaten, say the authors, rather than being expelled through the gills or clogged around the pores.